Making sure of proper event follow-up will set you apart from the competition and keep you fresh in the minds of your prospects. Just remember to always plan your follow-up strategy before the event begins. All email marketing follow-ups should be written before the event takes place. Reading the event synopsis, session descriptions, and blog posts will give you a good understanding of the event and help you craft a compelling message that leaves a lasting impression. Learn more about the key strategies to promote your event through email. Check out The Definitive Guide to Event Marketing. Highlight what event at the trade show your prospect attended. You might want to create separate emails for leads you generated via booth visits, your sessions, or another event like a party or a luncheon. 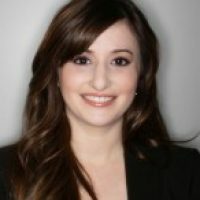 Personalize your emails by including name, company, or other unique details about that particular prospect. If it is a hot prospect, have the follow-up email come directly from the sales rep or the person from your company who had the most interaction with him or her at the trade show. 2. Follow-up in a timely manner. In order to remain top of mind with your leads, follow up right away. The first to respond often stands out, especially at a crowded event like a trade show. If you have attended a one-day trade show, make sure your follow-ups are teed up to go out, ideally that evening. At the most, make sure you follow up within 48 hours. If you are attending a multi-day event, you may want to create follow-ups to send out each day so you can get continuous engagement throughout the show. For instance, on day one, send out an email to everyone that attended your booth and advertise your speaking sessions on day one or a must-attend party. 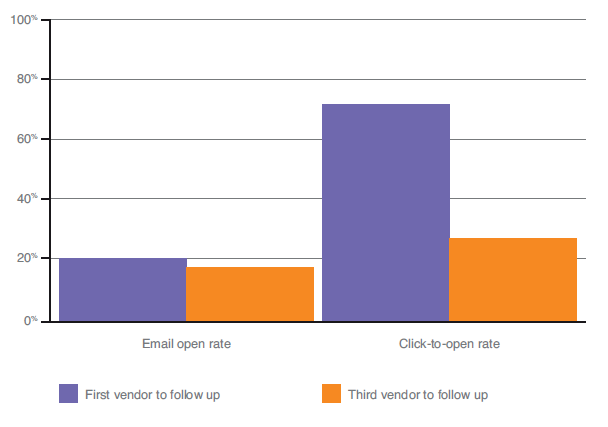 The chart below shows how big of a difference being the first vendor to follow-up makes. 3. Include a compelling offer. Once you have your lead’s attention, you want to present something compelling to take that person to the next step. It isn’t enough to just thank an attendee for visiting your booth. You want to also continue to engage her by offering a piece of content, or encouraging him to enter a contest or to attend a party. Always ask for the next move! Also, make sure to consider your audience. 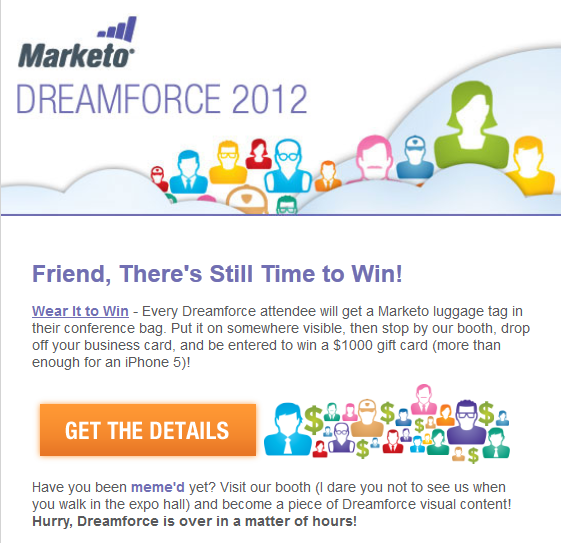 You want to send different offers and follow-ups to those that attended and those that did not attend your trade show. 4. Use pre-show intelligence to determine your post-show follow-ups. What emails and messaging worked best during your pre-show touches? Review reports about email deliverability, downloads, and who responded. Be on the lookout for a particular subject line or content asset that resonated. Testing is the best way to determine what is and isn’t working. A/B test throughout your trade show follow-up and continue to optimize. This works great for a multi-day event, but also helps you create better follow-ups each and every time you do an event. Sender name: We will test whether we get a better open rate for emails being sent from Marketo Events vs. the name of someone on the sales team. Text vs. HTML: Depending on the event and context, we will test text vs. HTML. A text email will often appear more personalized and generally work best for field marketing events while we find HTML works best for larger events. Offers: Try out different offers based on your personas, if they attended the event, or where you scanned or picked up their business card. We try contests, different pieces of content, videos, and other compelling calls-to-action to gauge effectiveness. Graphics: The look of an email can affect the conversion rate. At Marketo we test everything from button placement and header to different graphics in order to determine what appeals visually to our audience. Want to find out more awesome techniques to rock out your event strategy in 2013? Check out our brand new Definitive Guide to Event Marketing.